Kimchi is a spicy fermented condiment, similar in concept to German sauerkraut. Both of these two cabbage-based foods are used as strong flavor enhancers, but there are sharp differences between the two dishes. Korean kimchi is characterized by its intense spiciness and pungent notes. Traditional kimchi is made with gochujang, which is a paste made from a red pepper fermented soybean powder (among other things). Unfortunately, it can be a bit difficult to find. This proved to be the case when we decided to quench an overpowering kimchi craving and make up a batch at home. After some debate we decided to use Sriracha sauce as a substitute. Purists might be shaking their heads at this, but don’t knock it until you try it! 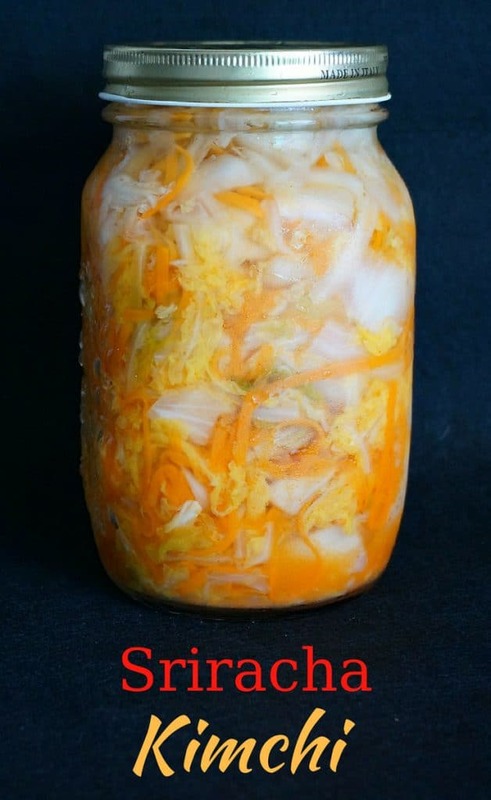 Kimchi will last for quite a while in the refrigerator, so feel free to make a large quantity. It’s great as a side dish, with fried rice, in Korean inspired tacos or gourmet burgers, and even on it’s own, straight from the jar. Making kimchi is done through a fermentation process, whereby the vegetables are broken down by bacteria. During the process the mixture produces bubbles and liquid escapes from the fermenting container. Be prepared for the accompanying odors during to be….strong. Find a well-ventilated spot to store the jars during the process. 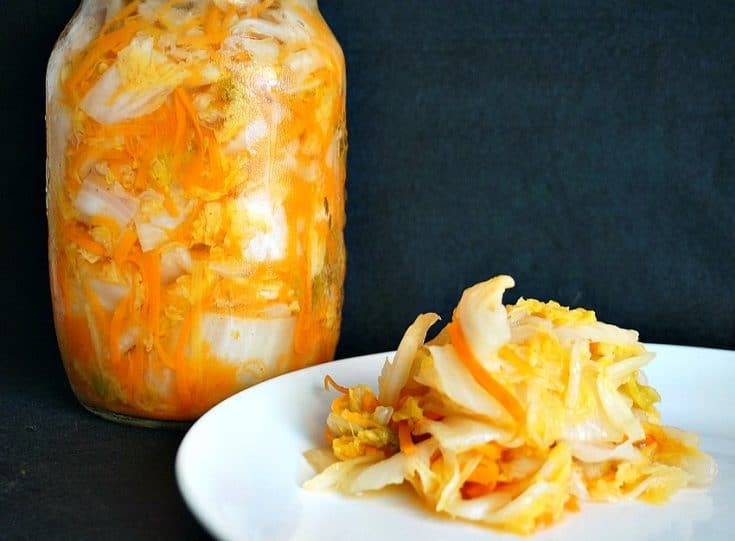 The fermentation also creates all sorts of “good” probiotic bacteria, similar to yogurt, making kimchi very good for you – in addition to lots of vitamins A, B and C. It is also a “gut-healthy” food that can help promote digestive health. 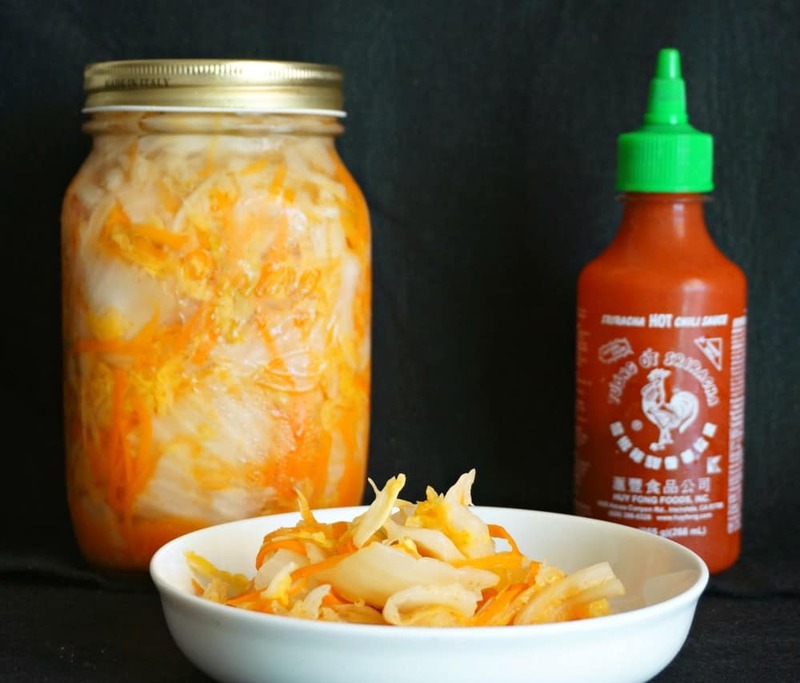 For many, after first trying kimchi it becomes a favorite condiment, partially for its health benefits for mostly for the flavor. Cut the cabbage lengthwise into quarters and remove the cores. Cut each quarter crosswise into 2-inch-wide pieces. Place the cabbage and salt in a large bowl. Using your hands (gloves are optional), massage the salt into the cabbage until it starts to soften a bit, then add water to cover the cabbage. Put a plate on top and weigh it down with something heavy, like another pot. Allow to sit for 2-3 hours, or until cabbage softens. Rinse the cabbage under cold water 3 times and allow to drain for for 20 minutes. Combine the garlic, ginger, sugar, fish sauce, and Sriracha sauce in a blender and mix to form a paste. Use 1 tablespoon of Sriracha for mild and up to 5 tablespoons for spicy. Gently squeeze any remaining water from the cabbage and return it to the bowl along with the carrots and scallions, and seasoning paste. Using your hands (again, gloves optional, but recommended), gently work the paste into the vegetables until they are thoroughly coated. Pack the kimchi into the jar, pressing down on it until the brine rises to cover the vegetables. No need to be gentle here - the goal is to get as much in the jar as possible. Place the lid loosely on the jar. Place a jar in a bowl or on a cookie sheet with raised sides. 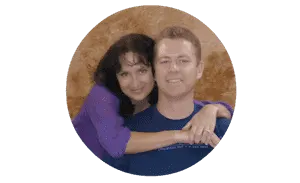 Let the jar stand at room temperature for 1 to 5 days. As fermentation starts to occur, the bubbles will form and brine may seep out of the jar, to be caught in the bowl/sheet. On a daily basis, use a knife or chopstick to release any trapped air in the jar, and push the vegetables underneath the brine. If needed, at additional brine to ensure the kimchi is covered. When ready (based on a taste test), you can refrigerate the kimchi. Refrigeration should stop the fermentation process, but keep the jar in the bowl in case there is additional seepage. For vegetarian kimchi, using 3/4 teaspoon kelp powder mixed water instead of fish sauce.